The previous post, Extreme Black and White, looked at B&W photography using just black and white with no or very few gray tones. In this article we will look at “smooth” black and white, using all or most of the tones available to digital B&W imaging. The images in this post are presented as JPG images with 256 shades of gray. That is enough to make well processed images appear gorgeously smooth and complete. Let’s start with a couple of examples. What the two photos above have in common is smoothly painted surfaces, fine detail, and sharp focus. Than can make very nice B&W photographs. Fine detail and texture can make photos come alive in B&W as the the next two examples show. Architecture has always been a favorite subject for black and white photographers. Image manipulation can be especially effective with such buildings and their environment. Click on any of the images to see then larger. Landscapes also can be very effective in well-processed black and white, bringing out dramatic skies is a popular effect. Indeed, black and white can be “smooth” and “gorgeous” with any subject that has a wide range of tones. The trick is “filling the histogram”, making sure that there are rich blacks and soft, subtle whites, and a full range of tones in between. Even flowers, normally a subject strictly for color photography, can look great in B&W. A smooth b&W photo can make you forget that the color is missing. Fine portraiture can be specially effective in black and white. Full tonal range, fine contrast, rich blacks, clean highlights, put those things into a photo and you have a fine image. If you have a compelling subject and draw the viewer into the picture, and you carefully attend to light and exposure, black and white can be smooth and satisfying. When we talk about black and white photography we really understand it as covering the full range of shades of gray from totally black to fully white. The monitor screen on which you are most likely to read this shows just 256 distinct shades. For this article I am presenting some extremes that cover a much more limited range. The absolute extreme, of just black and white, is normally called “silhouettes”, showing a form totally black or white against an opposite background. My “Bird on a Fence” here is an example of that. Another genre is “low key”, photos that are predominantly black. My “Two Glasses” is of that type. In fact, this is a color photo. There is much that can be done with “extreme black and white” that fits into and outside these categories. Here are some examples. As you can see, many of my images here are strongly manipulated to take the image to the “extreme”. And now just a little help here to get you started making silhouettes and similar “extreme black and white” images. Start with a photo that has strong shapes and contrast. The example here uses leaves against the sky. I will use my favorite tool, Photo Gallery, here. Of course, more powerful editing software will allow you much more creative control. An ideal photo will have a lot off light areas and a lot of dark areas and few middle tones. You can see this in the histogram that shows the tonal values from black to white. There is a “hole” in the middle of the data showing the scarcity of mid-tone values. The first step is turning the image into a B&W. Photo Gallery has tools for that in the Effects area of the Edit ribbon. The slider under the histogram can be used to turn this into an “extreme black and white” image. Move the white slider, on the right under the histogram, to the left until all parts of the image that are light in color are now fully white. Then bring the black slider up to turn what remains black, or mostly so. If you put the black slider right up and over the white slider you will have a pretty good silhouette. If you stopped short, you have a pretty extreme black and white image. Some photos lend themselves to being turned into such graphic black and white images, but it is best if you have that idea in mind when taking the picture so you can make sure you have the contrast and strong figures to start with. When it comes to contrast, black-and-white photography has a decided edge. A B&W image can be much more easily manipulated without loosing the “photo-reality”. In color photography contrast is much harder to manage. Possibly the toughest color for contrast control is yellow. In part that is because of the way the human vision system works. The highest visual contrast is yellow on black. Seeing contrast within a yellow object, on the other hand, is “delicate” at best. A pretty enough photo, but it lacks “spark”, contrast, in the delicate structures. In fact, it seems quite washed out. The photo shows little of the delicate tiny parts or the structure in the petals. This looked better to me, but already there are processing artifacts that will disturb discerning viewers. Now the emphasis is on the fine detail. The flower, set against the darker background, still feels luminous and bright. A very different presentation altogether. To me, the B&W photo is more the “wall-hanger” than is the color version. What do you think? The image links to a OneDrive folder which also contains a less aggressively processed version – you can compare the two by clicking the back-and-forward arrows. This B&W image is also a “participant” in Monochrome Madness 2-5 by Leanne Cole. Leanne does a marvelous job with these weekly collections of black and white photographs by a large group of contributing photographers. Be sure to check this out! There are two types of photography, in my view: Color and Black and White. Of course, there are many more genres of photography in each of those categories and there are other ways of looking at imaging. Leanne Cole started this topic with a post, Up for Discussion: Images in Monochrome, you can follow the link or see it reblogged a bit farther down. Another photography colleague, Solaner, mentioned one of his posts on this subject, color vs. black and white, which I have also reblogged (scroll down). There are times when a black and white image can carry your message better than a color version. That can become a lengthy discussion. For this article I want to look at some images that just don’t work as well in color. Color can interfere and some color photos are just not worth sharing. I will present some examples here. We have a favorite pond for afternoon strolls. There are fish and turtles living there and many birds, water birds, song birds, even raptors are frequent visitors. Plants and flowers are inviting subjects for photography. There is one big problem. The water is muddy from the run-offs that feed the pond and algae, pollen and other stuff make the water cloudy and an icky color. A photo of that idyllic Canada goose couple is marred by the unattractive color of the water – in a color photo. Emphasizing the color more turns it into a complete disaster. I tried some cropping and a plain black and white conversion. Next a added a very subtle vignette. To me this is a much more effective photo, it tells about the geese, and is not high-jacked by the green water. My friends know that I rarely leave well enough alone, so I just have to also show you my “café art” version of this image. That was exhibit one. Now on to the next one. A turtle was sunning itself on the bank. Here is my photo. Not exactly a prize-winner there. A strong crop, conversion to black and white and again a bit of a vignette and it is much improved, I hope you agree. Spring is just enveloping Georgia, here in the South of the U.S.A., and I shared a series of spring blossom images. Dandelions fit into that “harbinger of spring” mantra, however hereabouts they bloom year round. I came across a fine seed head in my lawn. Nothing much to rave about. This called for heavier processing. Sometimes a black and white image can say more, stir emotions that a “plain” color photo can’t. Look for the treasures hiding in your photos. In black and white photography it is all about the light, shapes and lines. Such images offer a totally different appeal from their color photo counterparts. Dramatic dark skies are a hallmark tool for stunning images. Here are some tips for getting the most from your color originals using simple tools. Let me start with a demonstration. This delightful sculpture showing workers taking a break on a steel beam gleams in this photo. The dark sky and deep shadows bring life to this image. It was derived from a rather ordinary color photo. The normal process is to use a color-filter conversion when making it into a B&W image. Pretty much all the photo editors provide such tools. In PaintShop Pro you can pick the exact filter color from a color wheel as illustrated below. 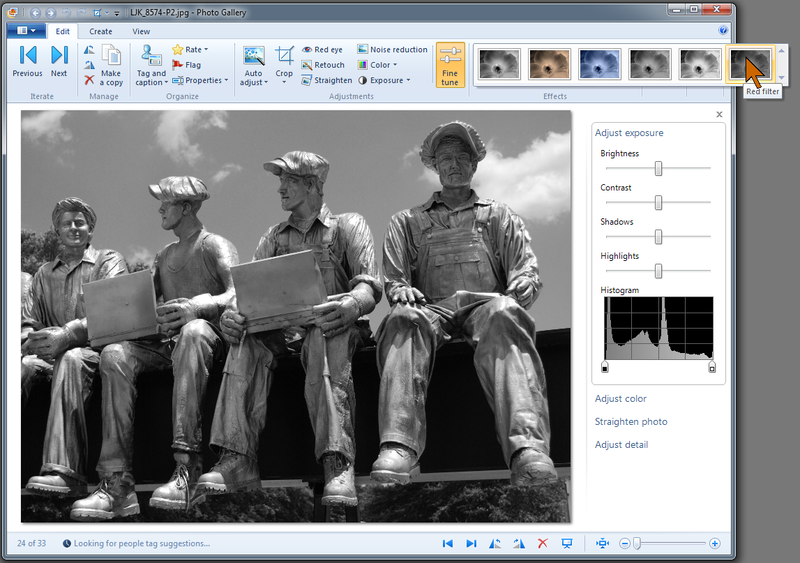 Similarly, Picasa has a “Filtered B&W” effect and the filter color is picked from a palette. Windows Photo Gallery offers a selection of B&W effects with several filter colors. With all of these tools the reddest filter does not provide that dramatically dark, almost black, sky for a normal blue sky in a photo. There is an added trick to achieve the deep dark sky: Adjust the color saturation to a very high level. The image below shows the results. The outside (left and right) portions show the normal photo with the normal result through a red filter. The inside pair shows a deeply saturated sky and the the resulting dark black and white image. One note of caution: The resulting black and white image will show a good deal of mottling in the formerly blue areas. A uniform sky will make this even more noticeable. So make the conversion in the largest image that you have. Make any size reductions afterwards to maintain a clean sky. This post was also published at Photography Notes and Tips. BLOGROLL: Sites I like - Links to sites providing related topics. Find RSS and email subscription links. How do I speed my PC back up? How do I set a shortcut for a website? How do I insert an image into a blog post using its URL?